Jewelry Casting: Which Karat Is Best For Gold Jewelry Castings? 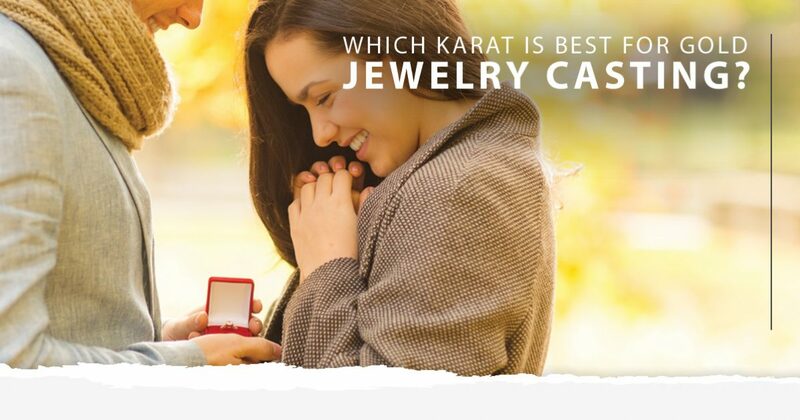 Which Karat Is Best For Gold Jewelry Castings? For some of your customers, gold jewelry is gold jewelry. They may not be able to tell the difference between 18K gold and 9K gold, and they may not know which variety of the metal is best suited for their needs. At Loren Castings, we are here to make your job easier, whether it is providing you with helpful resources to help educate your customers or providing you with high-quality gold jewelry castings. In today’s post, we’ll review five gold karats and examine the differences between each of them. Check them out below, then contact our jewelry casters with any questions you might have. Also known as “pure gold,” this type of gold is rare and beautiful. It is incredibly soft and malleable, which means that it must be mixed with another metal in order to be used in gold jewelry castings. Gold is commonly mixed with silver and copper to enhance its hardness and durability. Formulated from 75 percent gold, this variety of gold offers the best color and quality for jewelry. As such, most jewelers recommend 18-karat gold to their customers if it is within their budget, as the jewelry that is made from it will stand the test of time, even with daily wear. Slightly less pure than the 18-karat variety, 14-karat gold contains just over 58 percent gold and provides a brilliant color durability. This gold alloy strikes the right balance between quality and affordability, making it a very popular choice amongst newlyweds for their bridal sets. For customers who have a moderate budget, 10-karat gold makes quality jewelry that is strong and durable. This alloy contains around 41 percent gold, which may be less than others, but it still provides a nice, warm color that makes for beautiful jewelry. Although it is on the lower end of the spectrum, 9-carat gold should not be overlooked for gold jewelry castings. It contains the least amount of gold at around 37 percent, but it has an attractive price point and a unique coloring, as the red in the copper mix may start to shine through. As you can tell, different gold karats are better suited for some applications more so than others. Being able to explain this to customers in a way that makes sense and that they can relate to will not only build a strong rapport, but it can also help increase your sales. 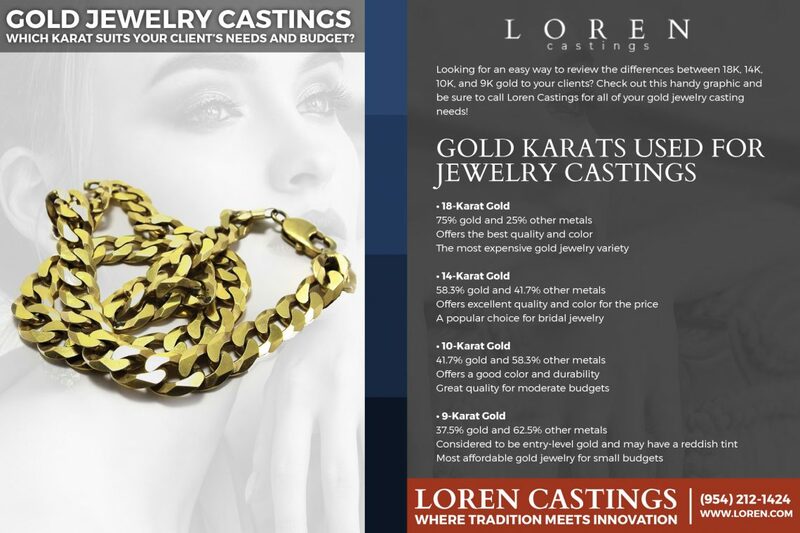 At Loren Castings, we are dedicated to unwavering customer service, and we are passionate about producing gold jewelry castings that help set our customers apart from the competition. To learn more about our casting process and the various services we offer, contact us at 954-212-1424 today, or request free information online now!